Focus Foodservice LLC is committed to providing the foodservice industry with products and services that provide exceptional value and create operational efficiency. Our team of foodservice professionals works to provide solutions in the foodservice industry. After years in the making, we proudly introduce our newest stainless steel coffeemakers, featuring innovative style and benefits. The new elevated double spigot allows for quick, versatile dispensing. Two dispensing lever options offer convenience with ease. Additionally, the cool touch feature is added for safety and the indicator lights take the guess work out of the brewing process. 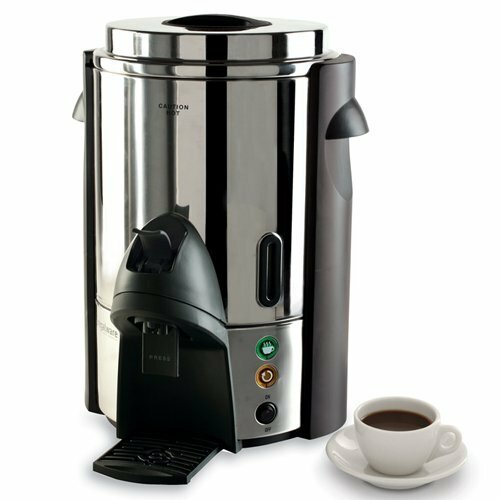 The Focus Foodservice Regalware 60 cup commercial stainless steel coffeemaker has an integrated spigot with a higher clearance to accommodate larger mugs and coffee cups. The dual option non-drip spigot features a locking feature and a one-hand dispensing option. Its stainless steel body offers greater durability and strength and the dual thermostats provide quicker heat-up and consistent serving temperatures. The coffeemaker features a twist-to-secure cover, interior water level markings and fast brew times-60 cups in less than 45 minutes. Cup capacity is based on 5-ounce cups (148ml). It comes with a 6-feet cord with a 3 prong grounded plug.